1994 ~ 2003 Professor of Musashino Art University Tokyo. 1997 "4 th Kitakyusyu Biennale " Kitakyushu Minicipal Museum of Art "
2002 "Lunar Project-Capture the moon light "
"Lunar Project ", which was performed on July 16, 2000 when a long total eclipse of the moon took place. 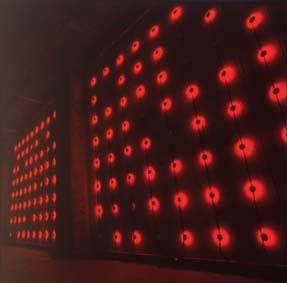 This project exhibited an installation designed to capture moon light with 18 large mirrors (150 x150cm) over a rice field. In 2001 he was also invited by NASDA (National Space Development Agency of Japan) as a fellow of "Space Art Projects " to join one of the "Feasibility studies " for the space assets like ISS. He experienced micro gravity through parabolic flights in order to attempt art performances while floating.